How would you like to gain access to the parking garage or building entrance, elevator or your office, all through your phone? by Brianna Crandall — April 15, 2019 — Openpath, a provider of workplace technology and security, unveiled at last week’s ISC West 2019 its new Elevator Board and Partner Portal to provide channel partners, property managers and tenants with even more comprehensive and convenient office security systems. Elevator Board enables Openpath to connect commercial spaces under a single, streamlined and secure mobile access system. And now, with Partner Portal, integrators can access best-in-class training and education online, enabling them to easily implement the best solutions for customers. On a mission to improve workplace efficiency and security, Openpath creates smart, secure access systems for the modern office. The company’s flagship product, Openpath Access, combines sleek hardware with an app, enabling employees to enter the office using their smartphones and making office management easier. With encryption at every level and powerful user-level permissions, Openpath Access adds both security and versatility. We are excited to provide our partners with the elevator solution they have been asking for. By bringing Openpath’s signature convenience and ease of use to the elevator, we ensure every single interaction tenants have with an Openpath-equipped building is frictionless, from the parking garage to their desk. The tandem release of Elevator Board and Partner Portal highlights our continued dedication to providing system integrators with both the top-notch technology that their customers want and the resources they need to easily and efficiently install our solutions. The market demand for highly reliable, convenient and secure access control solutions continues to expand as integrators and customers seek mobile access solutions that actually work. While many mobile access systems rely on only Wi-Fi, Bluetooth or LTE, Openpath’s proprietary Triple Unlock technology utilizes all three methods to guarantee the system remains online at all times, providing users with a reliable, seamless experience every time they use the Openpath solution. Over the past 30 years working in the access control industry, I have witnessed the market evolve and customers’ needs change. The Openpath product provides exciting features which, in today’s IT-centric environment, are desirable. In particular, Openpath’s unique ability to handle smartphone-based credentials, and the Elevator Board’s offerings, are especially exciting. Having now installed multiple systems, Global’s technicians, integrators and clients are very impressed with Openpath’s technical support, training, and overall willingness to assist to ensure a smooth delivery. The speed and ease with which both Global and our clients have been able to implement the Openpath solution is impressive. Elevator Board brings Openpath’s award-winning mobile access technology to the elevator. 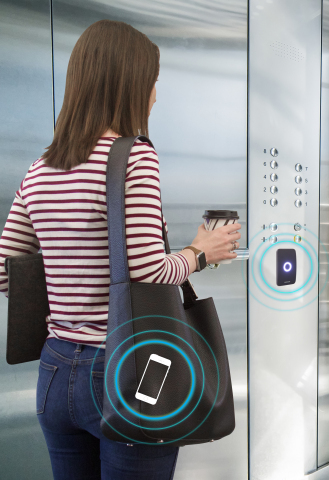 With the addition of Elevator Board to the Openpath product lineup, a single credential — a smartphone — can be used to access an office’s parking garage, building entrance, elevator and office door. For more information about Openpath Access or the new Openpath Elevator Board or Partner Portal, visit the Openpath website. Sustainability for tenant improvement projects January 17, 2019 In "How To » BOMI International"
See how Enlighted’s lighting-connected IoT sensor lets you upgrade to keep up with new capabilities as IoT technology advances for multiple building systems May 23, 2018 In "Products and Services » Lighting"